Tomorrow morning, I’m going to church. And not just any old church, either. 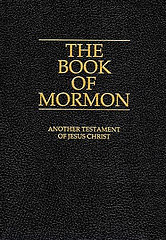 I’m going to visit the local church of “The Church of Jesus Christ of Latter-day Saints,” more commonly known as the Mormons. Have I suddenly found Jesus and become religious? No, but I am very curious to know more about this very young religion. Well, surely I can just stay home and read about it on Wikipedia? Well, I could, but for some reason I would really like to see it from the inside. Talk to some actual Mormons and hear what they think, what they believe. Gävle has had Mormon missionaries for as long as I can remember. Pairs of young men with nametags and backpacks, often sitting away from each other on the bus, in the hope of someone sitting down next to them so they can strike up a conversation. This summer, a pair of young women with nametags showed up on the bus, and I was quite surprised. I thought only the men went on missions. Just a few days ago, I happened to sit next to them on the bus and we talked a bit. We had a nice chat about this and that and I mentioned that I do not believe in any god, but that I am very interested in religion. I said I would like to know more about the Mormon faith, and they invited me to come to their church on sunday. So, tomorrow I am going to church. I can’t even remember the last time I was in a church, when it was not for a wedding or a funeral. It will be interesting.